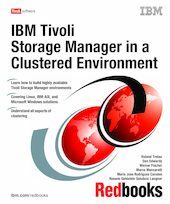 This IBM Redbooks publication is an easy-to-follow guide that describes how to implement IBM Tivoli Storage Manager Version 5.3 products in highly available clustered environments. The book is intended for those who want to plan, install, test, and manage the IBM Tivoli Storage Manager Version 5.3 in various environments by providing best practices and showing how to develop scripts for clustered environments. The book covers the following environments: IBM AIX HACMP, IBM Tivoli System Automation for Multiplatforms on Linux and AIX, MicrosoftCluster Server on Windows 2000 and Windows 2003, VERITAS Storage Foundation HA on AIX, and Windows Server 2003 Enterprise Edition. Chapter 1. What does high availability imply?